Weapons and shields can be enhanced through infusion, which adds elemental damage and/or modifies the attribute bonuses. 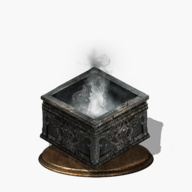 Infusions are conducted by Blacksmith Andre in the Firelink Shrine. In order to conduct certain infusions, Andre must be given the correct coal to work with. Unlocks infusion with Heavy Gems, Sharp Gems and Poison Gems. 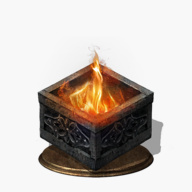 Found on the Road of Sacrifices, in the building right above the Farron Keep bonfire, guarded by a Black Knight. Unlocks infusion with Lightning Gems, Simple Gems and Chaos Gems. Found in Anor Londo, on the corpse of the Giant Blacksmith. Unlocks infusion with Dark Gems, Blood Gems and Hollow Gems. 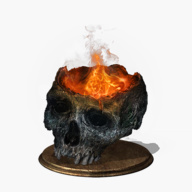 Found in the Irithyll Dungeon, in a cell on the lower levels, guarded by several Wretches. Unlocks infusion with Crystal Gems, Blessed Gems and Deep Gems. 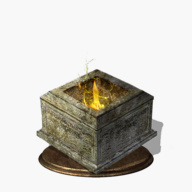 Found in Farron Keep, inside a small structure guarded by a Darkwraith. Heavy Gem Increases the Str. scaling, and reduces the base damage and Dex. scaling. Sharp Gem Increases the Dex. scaling, and reduces the base damage and Str. scaling. Refined Gem Balances the Str. and Dex. scaling and reduces the base damage. Raw Gem Increases the base damage, and removes all attribute scaling. Crystal Gem Adds Magic damage and Int. scaling, and reduces the base damage, Str. and Dex. scaling. Simple Gem Adds Magic damage to a weapon, as well as an FP restoring effect. Fire Gem Infuses a weapon with Fire damage, but removes all attribute scaling. Chaos Gem Infuses a weapon with Fire damage, and adds Int. and Fth. scaling. Lightning Gem Adds Lightning damage and Faith scaling. Blessed Gem Adds Fth. scaling and a slow health regen effect to weapons, but reduces Str. and Dex. scaling. Deep Gem Adds Dark damage and increases the base damage, but removes all attribute scaling. Dark Gem Can be used to infuse weapons, adding Dark damage, as well as Int. and Fth. scaling. Blood Gem Adds a Bleed effect, but reduces the base damage and attribute bonuses. Poison Gem Adds a Poison effect, but reduces the base damage and attribute bonuses. Hollow Gem Adds Luck scaling; Reduces the base damage, and Str. and Dex. scaling. Shriving Stone Removes infusions from weapons. If an infusion is not to your taste, you can remove the infusion by using a Shriving Stone on it at Blacksmith Andre. Weapons with certain infusions cannot be buffed, i.e. affected by spells like Magic Weapon or by consumables like Gold Pine Resin.